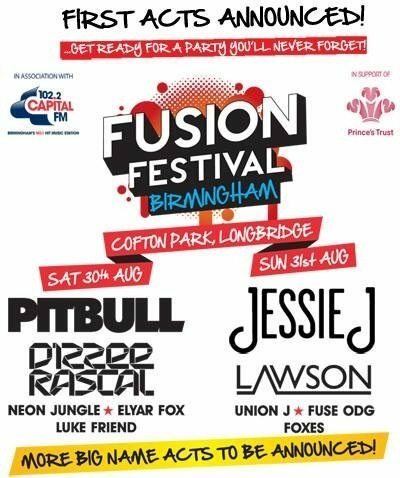 The first ten acts signed up to perform at Fusion Festival 2014 in Cofton Park in August have been announced this morning. Acts for the festival, which takes place on August 30th and 31st include Pitbull, Dizzee Rascal, Jessie J, Union J and Lawson. Organisers have also announced that ticket sales have opened for a special discounted offer for residents of the B31 and B45 postcode areas, ahead of general ticket sales which open on Friday. Enter the discount code RESIDENT at check out. IMPORTANT – This offer is limited to 4 tickets per household and you must live within the B31 or B45 postcodes to be eligible. Tickets will only be despatched to addresses within these postcode areas. If you place an order from another postcode region, YOUR ORDER WILL BE IMMEDIATELY CANCELLED. I live in 8 Thornthwaite B45 area I can’t find link to get my tickets half price help me please by sending a link.